Analyzed in detail using satellite imagery available today. Public fishing rights maps are in print form and available either online or printed. 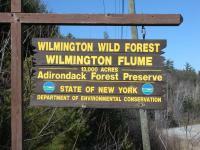 The Department of Environmental Conservation provides these valuable resources. The AuSable River watershed covers 512 square miles, includes 94 miles of river channel, and is fed by more than 70 streams, including its two major tributaries, the Chubb River and Black Brook. Seven towns, eight hamlets, and one incorporated village are located in the watershed, which covers portions of two counties. Except for a small area at the river's mouth on Lake Champlain, the entire watershed is located within the boundaries of the six-million-acre Adirondack Park. The river includes three major sections: the East Branch, the West Branch, and the Main Stem. The headwaters of the East and West Branches are nestled some 4,000 feet above sea level in the High Peaks of the Adirondack Mountains, on the southeast and northwest shoulders, respectively, of Mount Marcy, the state's highest peak. 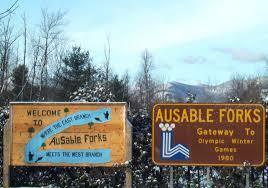 The East and West Branches might be seen as two separate rivers until they join forces at Au Sable Forks. From there, the river's Main Stem meanders through gently sloping lowlands before tumbling through the spectacular bedrock gorge of Ausable Chasm and entering Lake Champlain 100 feet above sea level. 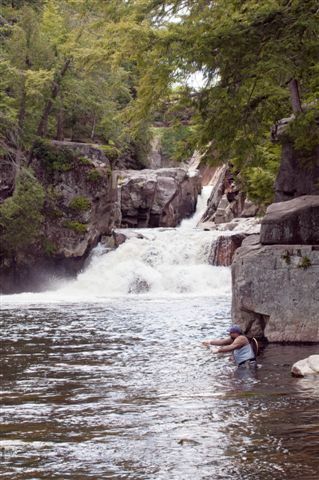 This rapid descent from its headwaters to the lake makes the Ausable the second steepest river in New York State—second only to its shorter neighbor to the southeast, the Boquet, which also drains the High Peaks into Lake Champlain. At its mouth, the Ausable forms a sandy delta that led French explorers to name it the "sandy river," or "river of sand." 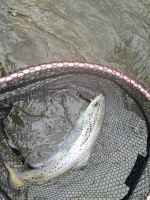 important in our combined efforts to restore a self-sustaining landlocked Atlantic salmon population. The main stem of the Boquet River originates on Dix Mountain in Keene; is 47 miles long; and empties into Lake Champlain in the Town of Willsboro. Major tributaries include: the North Branch; The Branch (aka The Little Boquet); Spruce Mill Brook and Lincoln Pond / Black River. 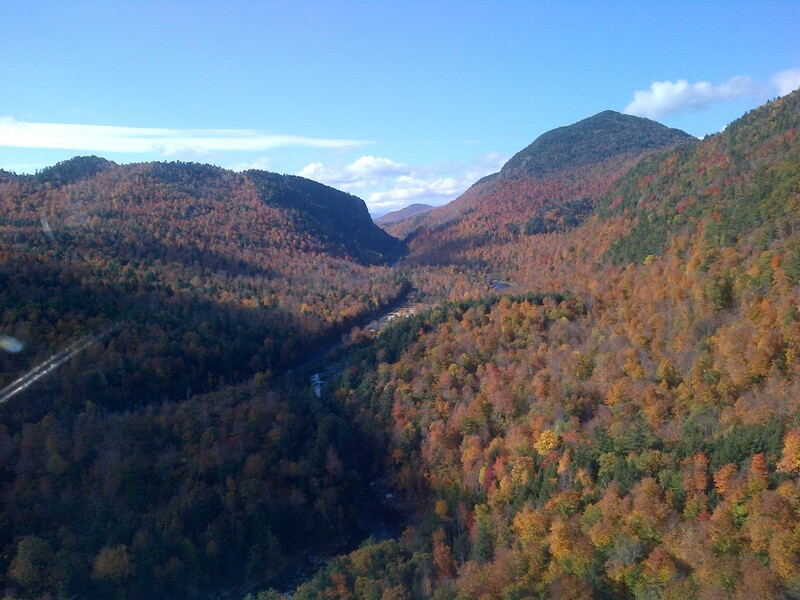 The Boquet River is the steepest river in NYS, descending more than 2,700 feet in 47 miles, making it prone to flash floods and erosion. 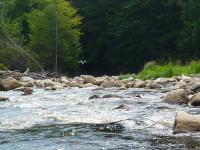 The Boquet River watershed drains 280-square miles. covers close to the entire watershed, except a section in the northeast corner. The Saranac River is an 81-mile-long. 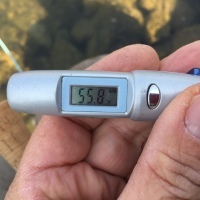 In its upper reaches is a region of mostly flat water and lakes. In the last third of its length, it drops two-thirds of its total drop and is known for having navigable rapids, which make it a popular site for whitewater kayaking and canoeing. The river encompasses Upper, Middle, and Lower Saranac Lakes, as well as Oseetah Lake, Lake Flower, Franklin Falls Pond and Union Falls Pond, and flows through the village of Saranac Lake; there are locks between Middle and Lower Saranac Lakes and between Lower Saranac and Oseetah, although the drop is only a few feet. Thirty-three miles further northeast, the river flows through the Town of Saranac, before winding through Plattsburgh, reaching Lake Champlain after a further 23 miles. 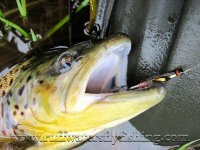 The Saranac River has a fairly diverse fishery, including northern pike, largemouth bass, smallmouth bass, rock bass, pumpkinseed, fallfish, brown bullhead, brown trout, and landlocked Atlantic salmon.